One of my favorite things about the Valley is that you can live here for nearly 10 years (like me), and still uncover new treasures all the time in the way of shops, architecture, pleasant main streets, and restaurants. Today I’m talking about the latter. When a friend asked if we wanted to double-date at a place in downtown Allentown, and described it as “the part of Allentown you would never go to on purpose”, I was intrigued. The only other information I got about this place: it’s in an old converted car repair garage (I love adaptive reuse buildings! ), but most importantly, the food was reallllllyyyyy ggggooooooodddd. In the car on the way there, I was discussing that I’m surprised I never ate here before, and seasoned eater Jon said “Well, it does say MEAT on the side of the building in huge letters”. Quite true. 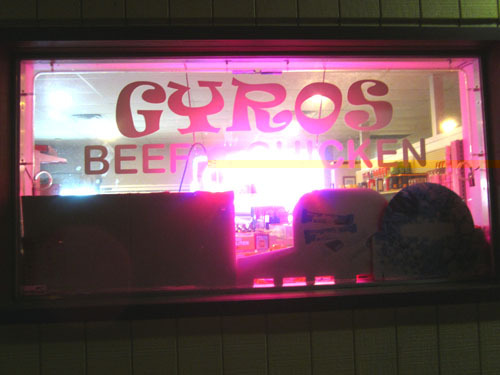 Vegetarians and vegans may see a place like this and keep driving – but inside is a wonderful world of Turkish foods, and despite what the exterior of the building proclaims, half of it happens to be vegetarian and vegan. Inside is a small market, four aisles of packaged desserts, pantry staples, beverages and frozen foods. 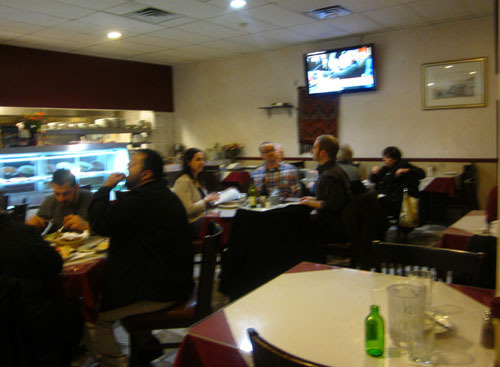 Behind a wall, there is a large dining room full of families and groups of friends enjoying food that smells so good you can’t help but salivate. I immediately notice that everyone seems to be engaged, sharing, laughing, telling stories, smiling. This is a place happy people go to eat. 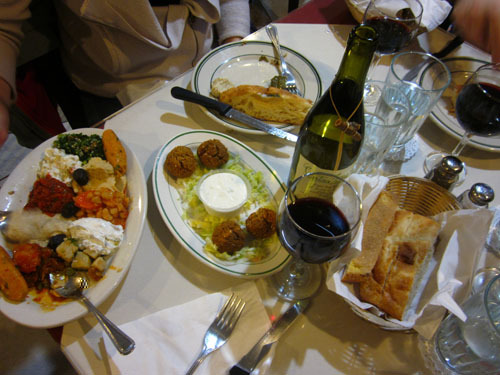 Four of us shared two orders of falafel and two appetizer samplers – don’t think TGIFriday’y. 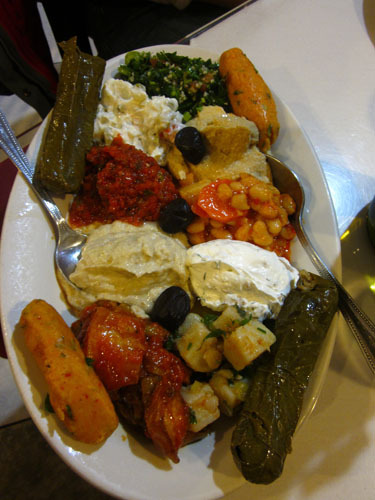 Think piles of hummus, baba ghanoush, THE BEST stuffed grape leaves I’ve ever had, and about seven more delicious things I don’t know the names of. Doesn’t matter. Your focus here should be on the fact that everything is made in house, fresh, impeccably flavored – even old standbys like hummus have new flair. You know everything is made with love and care. 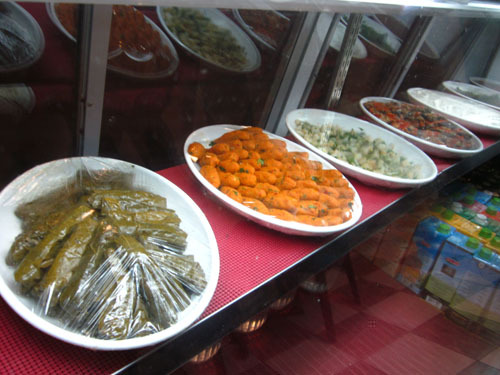 What I love about a place like this is while other restaurants feature these foods on the appetizer-only menu, Aci Halal knows them to be meals. Everything we ordered included 12 (TWELVE) different foods, 10 of which were vegan, the other two contained yogurt (I think?). So veg*ns, rejoice! This may very well become your new favorite place. Please invite me when you make dinner plans. As much as you may want to shovel everything down your gullet, they provide you with the softest, cripy-on-the-outside, cloud-like-in-the-middle bread to pull apart and use in place of forks. Pass the bread, dig in, put your hands full of food to your mouth. Share. No wonder everyone is so happy. 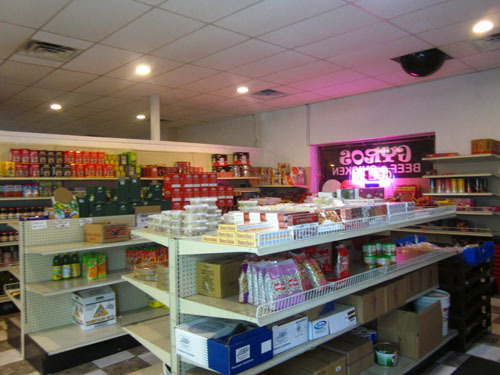 Turkish Market, Deli and Restaurant. Stay and eat or take some home! Go here to see their FACEBOOK page! And I wasn’t kidding about inviting me for dinner.